To reduce the risks of multiple gestation. To preserve fertility potential in the face of certain necessary medical procedures. To increase the chance of having one or more pregnancies from a single cycle of ovarian stimulation. To postpone embryo transfer for reasons such as high risk for severe ovarian hyperstimulation, need for imminent treatment for cancer or serious medical condition, concern over suitability of uterine lining or await results of genetic testing on embryos. There are several techniques for embryo cryopreservation, and research is ongoing. Traditional methods include “slow,” graduated freezing in a computerized setting, and “rapid” freezing methods, called “vitrification.” Most of the data on the success of frozen embryo transfer reported in the medical literature are derived from embryos frozen with the traditional slow freeze method. Recent studies comparing vitrification versus traditional method indicate that vitrification is at least as good as, if not superior to, traditional slow freeze method. Embryos can be frozen at different stages: pronuclear stage, cleavage stage or blastocyst stage. Depending on the stage at which embryos are frozen, freezing of the embryos can be performed anywhere from the first to the sixth day after fertilization. Generally only normally- developing embryos will be frozen. The embryos will be transferred through a series of solutions with increasing concentration of several cryoprotectants, substances known to protect embryos against damages from freezing, and then frozen. After the embryos are frozen, they are stored at a very cold temperature in liquid nitrogen (-196 °C; -321 °F). After a frozen embryo is thawed for intrauterine transfer, it is treated in a manner similar to that used in the IVF laboratory for non-frozen fresh embryos. Any thawed embryo which does not appear to be viable will not be transferred. 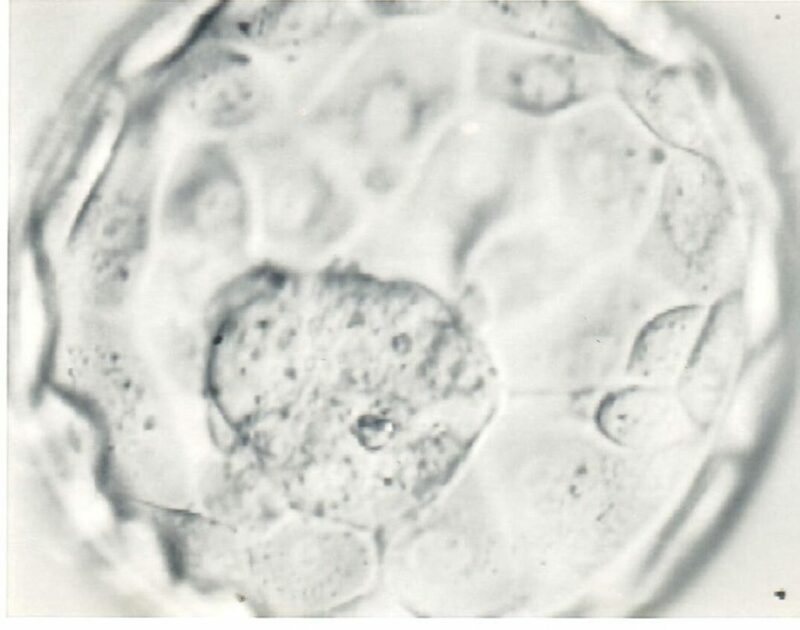 The first term pregnancy derived from frozen human embryo was born in 1984. As of 2008 it is estimated that between 350,000 and half a million babies have been born from frozen and thawed embryos in the world. Overall pregnancy rates at the national level in the U.S. with frozen embryos are lower than with fresh embryos. This, at least in part, results from the routine selection of the best-looking embryos for fresh transfer, reserving the ‘second-best’ for freezing. There is some evidence that pregnancy rates are similar when there is no such selection. Current techniques deliver a high percentage of viable embryos thawed after cryopreservation, but there can be no certainty that all frozen embryos will thaw normally, be viable enough to divide, and eventually implant in the uterus. Freezing techniques theoretically could be injurious to human embryos. Embryos must be kept frozen in liquid nitrogen at -196 o C so as to preserve their viability when thawed. Equipment failure, e.g. damage to the storage tank where the embryos are kept frozen, can occur with any technique that necessitates mechanical support systems. Extensive animal data (through several generations) and limited human data to date do not indicate any likelihood that children born of embryos that have been frozen and thawed will experience greater risk of abnormalities than those born of fresh embryos. Many studies have been conducted since 1994 to evaluate the obstetric and perinatal outcome of children born after frozen embryo transfer. According to a systematic review (Wennerholm et al., 2009), and two recently published large studies: one Danish population-based cohort study (Pinborg et al., 2009) and another Finnish register-based cohort study (Pelkonen et al., 2010), the health of children born after frozen embryo transfer is comparable or even better than that of children born after fresh embryo transfer. Furthermore, in population-based registry studies (Westergard et al., 1999; Shih et al., 2008; Pinborg et al., 2009) major malformation rates did not show significant difference between frozen embryo transfer and fresh embryo transfer children. Until very large numbers of children have been born after freezing and thawing of embryos, it is not possible to be certain that the rate of abnormalities is no different from the normal rate, especially for infrequent outcomes such as congenital anomalies and possible disturbances in development of children.. Furthermore, cryopreservation does not eliminate the normal risk of obstetric complications or fetal abnormalities. Any embryo that is not transferred or frozen has to be discarded. There is no other means to preserve these excess embryos. An alternative to freezing any excess embryos not transferred in the fresh cycle will be to inseminate a limited number of oocytes on the day of oocyte retrieval. Any remaining oocytes that are not inseminated can be frozen. These frozen unfertilized eggs, whether mature or immature, can be thawed at a later time, cultured to maturity if needed, and inseminated to allow fertilization. Please refer to egg freezing for further information. Aytox A, Van den Abbeel E, Bonduelle M, Camus M, Joris H. Van Steirteghem A, Devroey P. Obstetric outcome of pregnancies after the transfer of cryopreserved and fresh embryos obtained by conventional in-vitro fertilization and intracytoplasmic sperm injection. Hum Reprod 1999;14:2619-2624. Kallen B, Finnstrom O, Nygren KG, Olausson PO. In-vitro fertilization (IVF) in Sweden: infant outcome after different IVF fertilization methods. Fertil Steril 2005;84:611-617. Pelkonen S, Koivunen R, Gissler M, Nuojua-Huttunen S, Suikkari AM, Hyden-Granskog C, Martikainen H, Tiitien A, Hartikainen AL. Perinatal outcome of children born after frozen and fresh embryo transfer: the Finnish cohort study 1995-2006. Hum Reprod 2010:25:914-923. Pinborg A, Loft A, Aaris Hennigsen AK, Rasmussen S, Nyboe Andersen A. Infant outcome of 957 singletons born after frozen embryo replacement: The Danish National Cohort Study 1995-2006. fertile Steril 2009. doi:10.1016/fertnstert.2009.05-091. Schieve LA, Ferre C, Peterson HB, Macaluso M, Reynolds MA, Wright VC. Perinatal outcome among singleton infants conceived through assisted reproductive technology in the Untied States. Obstet Gynecol 2004;103:1144-1153. Shih W, Rushford DD, Bourne H, Garrett C, McBain JC, Healy DL, Baker HW. Factors affecting low birth weight after assisted reproductive technology: difference between transfer of fresh and cryopreserved embryos suggests an adverse effect of oocyte collection. Hum Reprod 2008;23:1644-1653. Sutcliffe AG, D’Souza SW, Cadman J, Richards B, McKinlay IA, Lieberman B. Outcome in children from cryopreserved embryos. Arch Dis Child 1995;72:290-293. Wada I, Macnamee MC, Wick K, Bradfield JM, Brinsden PR. Birth characteristics and perinatal outcome of babies conceived from cryopreserved embryos. Hum Reprod 1994;9:543-546. Wang YA, Sullivan EA, Black D, Dean J, Bryant J, Chapman M. Preterm birth and low birth weight after assisted reproductive technology-related pregnancy in Australia between 1996-2000. Fert Steril 2005;83:1650-1658. Wennerholm UB, Hamberger L, Nilsson L, Wennergren M, Wikland M, Bergh C. Obstetric and perinatal outcome of children conceived from cryopreserved embryos. Hm Reprod 1997;12:1819-1825. Wennerholm UB, Soderstrom-Anttila V, Bergh C, Aittomaki K, Hazekamp J, Nygren KG, Selbing A, Loft A. Children born after cryopreservation of embryos or oocytes: a systematic review of outcome data. Hum Reprod 2009;24:2158-2172. Westergaard HB, Johansen AM, Erb K, Andersen AN. Danish National In-Vitro Fertilization Registry 1994 and 1995 a controlled study of births, malformations and cytogenetic findings. Hum Reprod 1999;14:1896-1902.